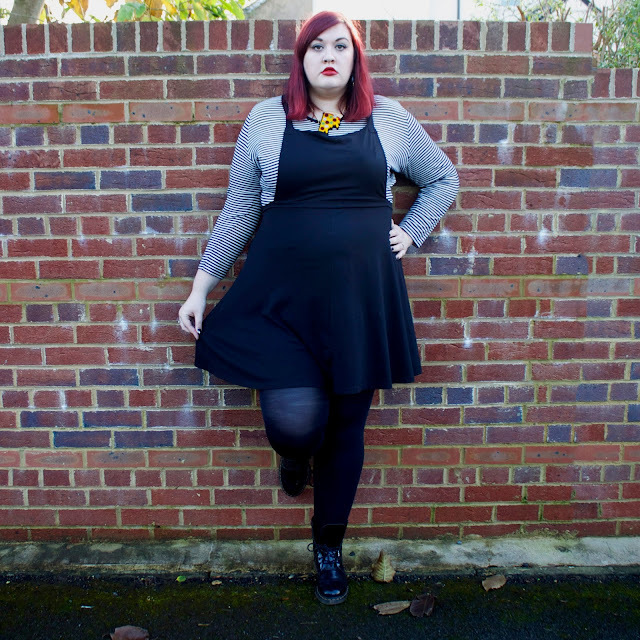 I bought this ASOS Curve Jersey Pinafore dress about 8 weeks ago and its become such a solid staple in my wardrobe that I didn't blog about it because I thought it was a bit old? Thats how comfortable I am in it. I forgot it was new. Asides from being super comfy, versatile and being a good transitional season pieced, it's a good length if you are taller as well, like my knickers aren't being flashed if I have to bend down which is a huge plus. The top came from TU at Sainsburys by accident. I was out and had spilled something down me so I told my husband to grab a long sleeve top from Sainsburys which was the closest place to us that I knew might do something in a plus size. Its a bit short in the body but that doesn't super matter if its under this dress, and it goes perfectly. You can now order direct from the site, which I believe is a relatively new thing as I tried to do this in the summer and there was sadly no option! At £6 I might go and grab a couple of others because despite its price its really good quality. These pictures were taken BBBH (before babyliss big hair) which has basically changed my life, but this was the first time I styled it myself after its cut and I have to say I am in love with it. I am even loving the colour which is odd because i had planned to go blonde, but I am in two minds. 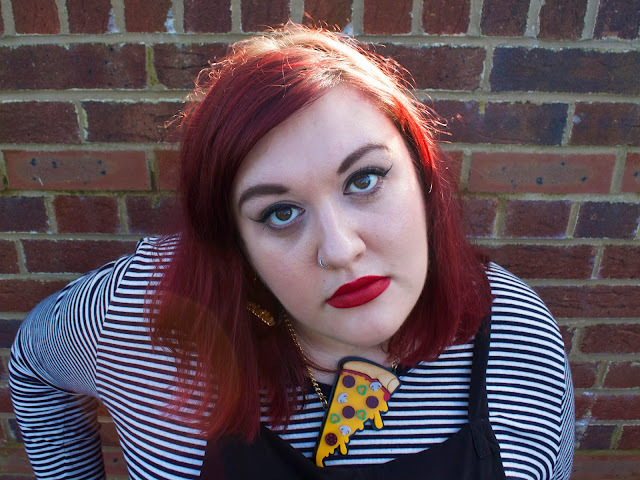 Much like this Pizza necklace, which is something I slipped in at the start of Autumn but hasn't had much love or promotion. Its probably in the top five things I have ever made so check it out.